Le Physique | Vancouver Personal Training | Holy! Osteoporosis what? Osteoporosis is often called the silent disease because one can develop osteoporosis without experiencing any symptoms. Individuals diagnosed with osteoporosis are characterized by having low bone mass and deterioration of bone tissue. Some people can also get secondary osteoporosis, which is when other diseases (or treatments for other diseases) causes osteoporosis. By looking at the image above we can compare the difference between normal looking bones and bones inhibited by osteoporosis. Osteoporosis is mainly common in the hip, spine, wrists and shoulders. What exactly is happening to your bones? In healthy adults, bone is being constantly being absorbed into the body and then rebuilt. This is called bone remodeling, in this process bone is removed daily in small amounts (resorption), followed by deposition of new minerals. A balance between resorption and deposition is crucial for maintaining bone strength. This balance is maintained by two main types of cells called osteoclasts and osteoblasts. Osteoclasts have a key role in bone resorption, while osteoblasts are in charge of bone deposition. Osteoclasts contain highly active ion channels in their cell membrane that pump protons into the extracellular space thus lowering the pH of their microenvironment. This in turn dissolves the bone mineral causing bone resorption. This is followed by bone deposition of the osteoblasts laying down new bone material. A balance between the activities of these two cell types determines whether bone is made, lost or maintained. Osteopenia (bone weakening) and osteoporosis occur when this balance is not kept, and there is an excess amount of resorption taking place. Bone mass and density however, increase and peak at around age 30 and then slowly bone loss starts taking place. 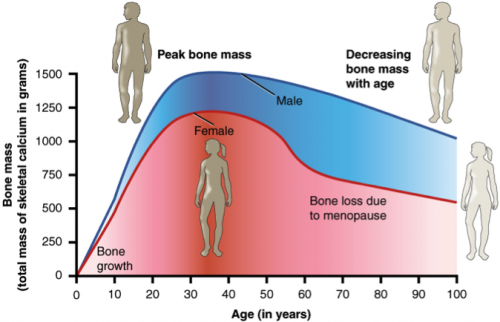 How do we differentiate from the normal bone loss that comes with age and osteoporosis? 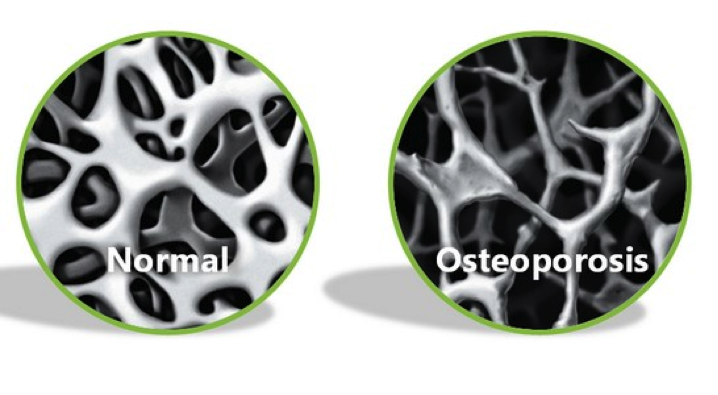 The only reliable method for diagnosing osteoporosis is by performing a BMD (bone mineral density) test. A person with thinning bones may be diagnosed with osteopenia, which can then further develop into osteoporosis. What might predispose you to osteoporosis? Family history of bone fracture. Loss of height (widow’s hump). Chronic diseases such as anorexia nervosa or liver disease. Long-term corticosteroid or anticonvulsant drug therapy. Fractured bones as a result of osteoporosis are more common than heart attacks, stroke and breast cancer combined. 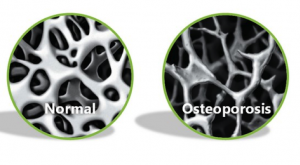 Osteoporosis is prevalent in both men and women, and can strike at any age. Building strong bones in childhood and adolescence is your best defensive tool against osteoporosis later. 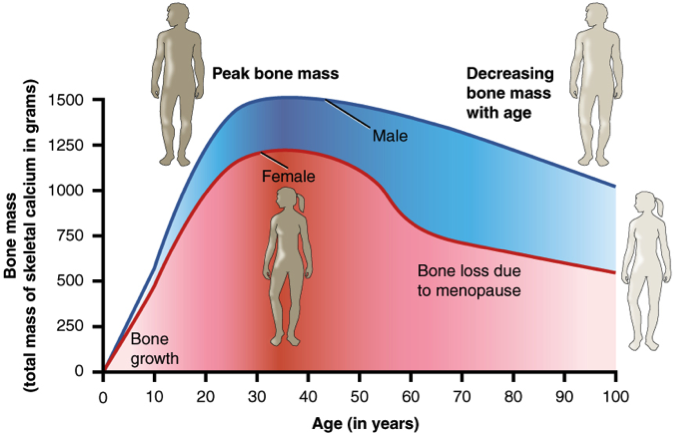 Women and men both begin to lose their bone mass around their early 30’s, but women are more vulnerable to osteoporosis close to menopause (about 2-3 %/ year). 1 in 3 women and 1 in 5 men will suffer from an osteoporosis fracture in their lifetime. The overall yearly cost for treating osteoporosis in 2010 was over $2.3 billion. Osteoporotic hip fracture will undergo more bed days than patients suffering from a heart stroke, heart attack or diabetes. Without BMP testing 80% of patients with bone fractures, will not know that they suffer from osteoporosis therefore do not receive adequate osteoporosis treatment. Though one might think that exercise is possibly the worst thing anyone can do if they have osteoporosis because of the increased risk of bone fracture and overall bone frailty but this in fact is not true. Exercise has been proved to strengthen and helping individuals suffering from osteoporosis. Always consult with your doctor before starting a new exercise program. The reason for this is that different types of exercise pose a different kind of risk. It is also important to perform a comprehensive risk assessment test so that the risk of fracture is known – by the individual, their doctor and supporting health care team (ex: kinesiologist, personal trainer or physiotherapist etc). When the risk of fracture is known, the team can then successfully implement exercises without placing the individual at risk. Weight bearing exercises that force your muscles and bones to work against gravity, are the most effective in maintaining strong bones and overall heart health. Specifically performing weight bearing exercises is important because of the “impact” on your skeletal system every time you touch the ground. Don’t let the word impact scare you, it doesn’t mean you should start an aggressive jumping aerobics or plyometrics class. Walking, for example, is a “low” impact activity, or if you recall “low impact aerobics classes” from the 80’s – those count! Though the bike and the elliptical are a form of weight bearing exercises there is less impact on your joints. Both of these machines don’t place as much force through your skeleton compared to activities where your foot comes in contact with the ground. It is important to keep in mind that any impact that you are making on your joints with proper spinal position will help maintain healthy bones! Aerobic activities like walking, jogging, soccer, volleyball, basketball and racquet sports. Will weight lifting help osteoporosis? With weight lifting or strength training, the bones and muscles work by pushing and pulling a load. These type of exercises are beneficial as they help increase muscle mass and bone strength, and helps to increase bone density by creating stress on your bones which signals the hormones (thyroid and parathyroid) to take more calcium in your bones, which in turn causes an increase in bone density. Osteoporosis only happens to older people, right? Ohhh, sneaky question – what do you mean by “older people”? The term “secondary osteoporosis” mentioned above, affects both adults and children, which is to say that their osteoporosis results from a different disorder, or even as a result of therapy for other issues. But the thing to consider is that osteoporosis can affect adults in their 40s and early 50s. While you can be aware of any predisposition factors that may put you at higher risk, osteoporosis is not something that affects all people, equally. 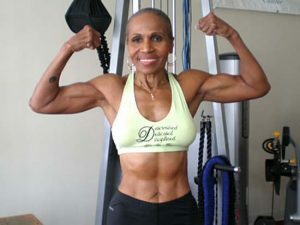 This 74 year old body builder, Ernestine reports that she didn’t step foot in a gym until she was 56 years old and feels better now then she ever did. 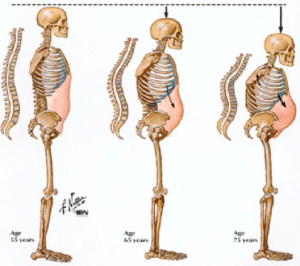 I don’t want to “shrink” or get a rounded back – what about posture training? I’m so glad you asked! This type of exercise is particularly beneficial for individuals suffering from back osteoporosis and overall prevention of spinal fractures, and it is also important if you are at risk, as a preventative measure! Posture training can help prevent kyphosis (a forward curvature in the spine) or development of a Dowagers hump by strengthening your back, opening the chest (lengthening the anterior line), improve general comfort and improve balance. I’m worried about myself or my parents falling and breaking a hip – will improving balance help with osteoporosis? While balance training directly won’t improve an osteoporotic condition, improving your balance can help reduce the risk of falling and fractures. This kind of training is very applicable to everyday life as we never know when we are going to have an unexpected movement that will cause us to lose balance. However, some caution needs to take place with this type of training because balancing exercises do increase the chance of a fall. Therefore it is crucial that the trainer is observing and that safety precautions are in place. Another example of balance training is Tai chi. 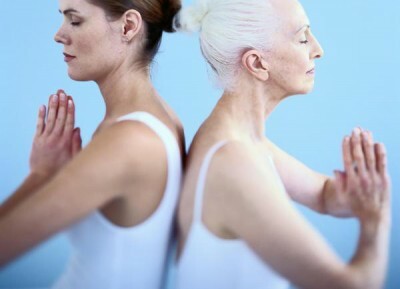 Is Yoga good for osteoporosis? The benefits gained from stretching (whether you do it in yoga, pilates, or on your own), maintaining or improving flexibility and range of motion is great! Having an appropriate range of motion helps improve posture, which reduces chances of developing kyphosis (as discussed above), improves breathing and facilitates balance training. The greater the flexibility one has, all activities, such as playing with your nieces, nephews, grandkids, gardening and all sports such as golf, skiing, running, hiking and tennis become easier and enhance performance. Now we’re not talking about doing the splits or being able to put your ankles around the back of your head, when I say “greater” I am referencing the fact that with age, many of us begin to lose flexibility due to inactivity or habits we’ve developed. There are “normal ranges of motion” around specific joints that are important to maintain for overall health. Well there you have it folks! Regardless of whether you have osteoporosis or not you should still be living an active and healthy lifestyle. Exercise with caution, eat a healthy diet and take into account the preventative steps I have outlined here, to ensure you are maintaining strong bones and a strong body! Can osteoporosis cause stomach pain and distension? Stomach pain and distention isn’t a accompanying symptom that is typically reported *with* osteoporosis. If you’re experiencing these symptoms and concerned about the possibility of being diagnosed (ex: there is a family history or you are experiencing symptoms that were mentioned in the post) then a quick trip to your doctor would be able to help put your mind at ease, or help get the treatment needed to resolve any discomfort you’re having. Good luck and all the best!